Finocchio or Florence fennel is a different variety to the fennel plants we see growing around railway sidings and creeks. While this wild fennel still yields seeds, fronds and flowers that are edible, Florence fennel forms a bulb-like growth at the bottom and this is the part that is eaten. Here in Australia fennel is in season in winter so look for cheap, fresh fennel bulbs then. Fennel is surprisingly versatile though some people find the anise flavour to be a bit of an acquired taste. It works well roasted or fried and it is good finely diced and fried along with celery, carrot and onion at the beginning of a ragu or bolgnese sauce. 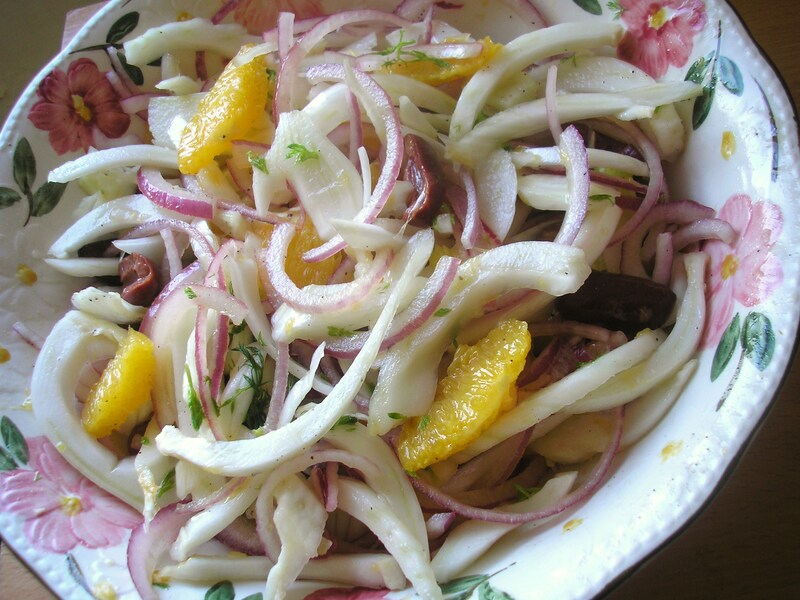 It can also be eaten raw with a citrus dressing. Served in this way, it is a fresh accompaniment to all those heavy winter dishes. Using a sharp knife, halve the fennel bulb and remove the core. 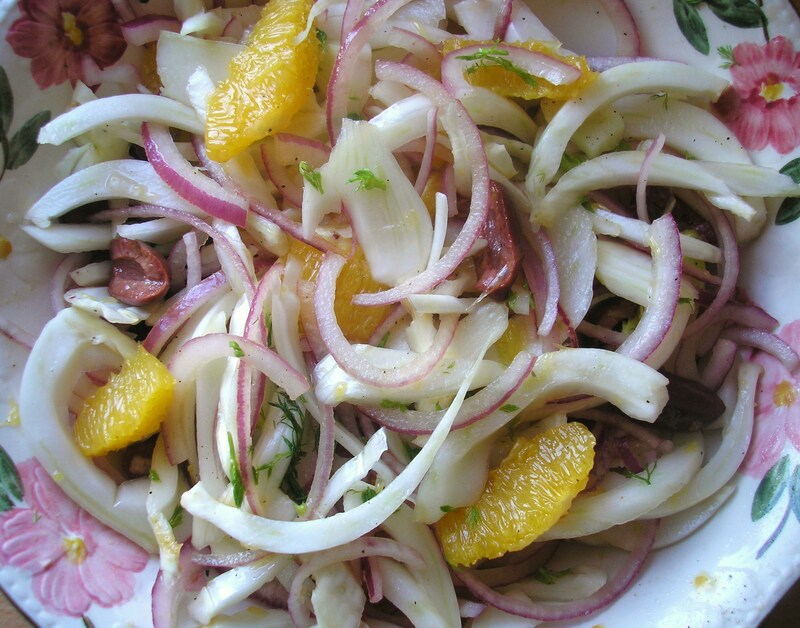 Finely slice the fennel and place in a large bowl. Pour over the lemon juice and gently toss. Segment the oranges and place them in the bowl with the fennel. Add the Spanish onion, finely sliced and the olives, pitted and halved. Pour over the olive oil, season and toss. 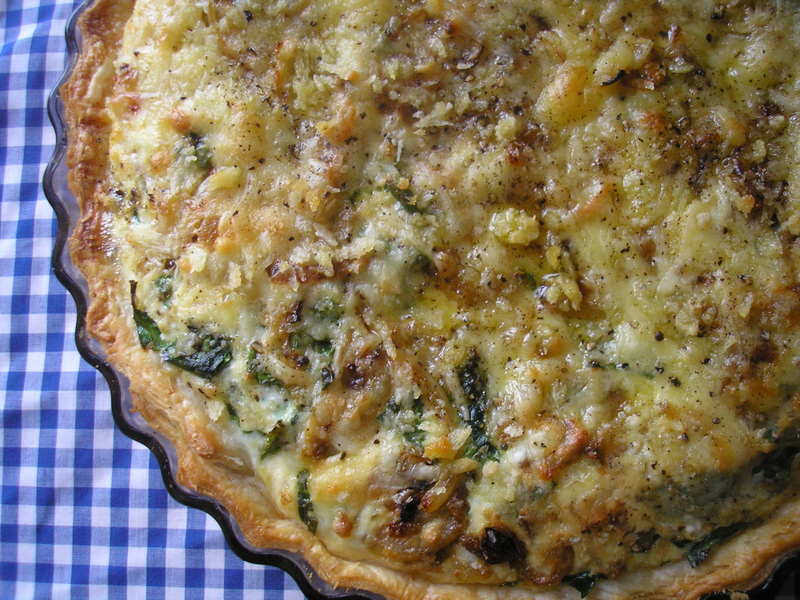 Reserve the fronds from the fennel bulb to garnish.